Is that title a bit weird? Maybe. Books I’m really enjoying influence me a lot [my family and friends would confirm this right away] and one of those I’m currently reading inspired this title. Because it’s been mentioned quite a lot already, you might know that loneliness is considered a major risk factor for developing dementia later in life. It’s not a fact anybody would be proud to reveal about themselves but yes, I’ve been spending a lot of time by myself in past years. In part this is natural for being an introvert but at the same time, even us introverts need other people in our lives to be truly happy. It’s not that I’m never around others but it’s not enough for my own needs. Which is a fact that an ED masks. It makes you feel like you preferred staying home and sticking with comfortable routines. Only this isn’t true but if you’re struggling/have struggled with an ED yourself, you’ll know it can be hard to differentiate your own voice from that of the ED. The one that’s telling you lies about who you are, what you like and at that heavily limiting you in following your dreams. Long story short: This past week fell under the motto of stimulating those neurons [= preventing dementia] aka breaking routines, making good memories and trying new things. I will say it feels uncomfortable to write these confessions because I’m afraid of what kind of a person it makes me look like. Please note that these things don’t keep me from working or interacting with my colleagues; it’s outside of work that I struggle. Yes, I’m in my twenties and struggle with these things but mental illnesses know no age limits and while I wish I’d taken action a lot earlier, late is better than never. On a blogging note, I’m sorry I’ve been MIA since the past Monday and neither commented on any of your posts nor published the good good links. Traveling for my aunt’s 50th birthday in Berlin [leaving Thursday night and getting back on Sunday] and feeling a little under the weather got in between me and blogging. I’ll definitely catch up on your posts this week and will also post the link lovin’ on Friday. Hope you understand. Thanks to Meg for hosting our fun little Monday gathering! Worked just a few days and was thankfully able to some off to allow for the trip to Berlin, leaving on Thursday afternoon. Made an overdue appointment I’d been postponing forever. Met a friend who was housesitting her parents’ place on Tuesday night and talked for hours. You know you’re with a truly amazing friend when you don’t even realize time passing by in the blink of an eye. Spent Friday with abovementioned friend who spontaneously decided to meet me in Berlin again. It was one of the best days in a long time and I couldn’t be more grateful for this friend. Spontaneously bought another book while in Berlin. I don’t think I ever made a decision on a book that fast and spending on myself twice in this close succession? Definitely an accomplishment. Granted, having a friend around convincing me it was fine helped. Went out to eat at a fully vegan Vietnamese restaurant, 1990 Vegan Living. Funnily enough, it wasn’t me but my very much non-vegan brother suggesting this. Their concept is best described as the Vietnamese version of tacos, as in: you order several small bowls, at best to be shared around the table. We admittedly didn’t do a lot of the latter because all of us were pretty hungry at that point but it was an amazing experience nonetheless. Unfortunately, my camera didn’t tag along for the journey and the pictures on my phone didn’t turn out due to the dim lighting situation in the restaurant. I did find a few pictures on Instagram, though. Too bad we didn’t have another opportunity to eat out because I really wanted to go back. Ate intuitively during my whole stay in Berlin. This is something I find really hard at home but being in a completely different environment and around people who make me feel good, food was barely an issue most of the time. Note to self [that I already knew deep within]: travelling is a key to getting unstuck and closer to [food] freedom. One more note on this that might be relieving for anybody struggling to eat intuitively is that listening to my hunger cues, I actually ate less than usual. Please note that this was neither my intention nor will I ever promote restricting your intake, much less sell intuitive eating as the “how to eat less” solution. I was careful in still eating enough to not loose weight but it was relieving to see that I can trust my hunger. Now to develop this trust and ability to listen to my intuition at home. Pictured below is merely a stand-in of a past Asian meal to make up for the lack of photos taken this past week. Proved my anxious mind wrong by experiencing all of the above rather than the version of this trip my brain had pictured. The only unfortunate bit of the trip is that I’m now home with an icky cold. Lots of tea and sleep for me today. Tell me about your past week! Highlights, topics on your mind, news – anything. How does traveling change you [if it does]? How did you stimulate your neurons in the past week? Sometime this year, I will get back into an actual/reliable/better posting schedule, I promise you that. Though – in my defense – I had plans of posting in the past week. But now that the laptop issue is solved, my internet connection obviously decided it wasn’t having it [read: it was either slower than slow (and ours already is slow) or simply non-existent]. Did I mention technology is frustating me to no end?! Okay, enough ranting about things I can’t change and onto the things I can’t change anymore, either, but also wouldn’t want to if I could. As in: a Week in Review of only the good parts of the previous seven days. Life still isn’t all sunshine and rainbows here and it will take time to get to that point [or close because we know perfection doesn’t exist] yet I nonetheless had some really really marvellous moments lately. Thanks to Meg for deciding everybody should start the week focusing on the good instead of the bad things. Spent time with my favourite little human. P. and my sister stayed at my parents’ house for a few days so she could study while the grandparents had an eye on P.. Time and time again, it’s amazing how much a toddler changes us, our priorities and just makes us feel happier. Whether it’s allowing you to see the joy in little everyday things you usually overlook or the – yes, often cited – way they approach food. And when they let you borrow their bobby car and you burst into the deepest laughter in a long time, you forget all about life’s heaviness for an instant. Did another pantry and all-around-apartment purge. This is a task by no means finished yet but starting to tackle it felt very freeing. It also made me ponder getting Marie Kondo’s book because I have a hard time getting rid of certain items. Have any of you read it? If so; How did it help you? Spontaneously went to a concert. A few days before, a notification of said concert not too far from where I live popped up on my Facebook account as I liked the band’s page years ago but had almost forgotten about that. Spontaneity definitely isn’t one of my strengths and given going there meant forgoing an evening with P. and my sister, I almost put it off again. A friend deciding to tag along was the ‘accountability’ I needed and I’m so glad I went. The concert was plain amazing. If you like a capella music – or even if you don’t [yet] -, listen to their version of Get lucky. It’s brilliant. Got back into food blogging a little. Read: Created a new recipe for a vegan mint chocolate tarte. I don’t even remember when I last shared a recipe on here. It felt good to be back in the kitchen [outside of daily food preparation, obviously] but the photography part reminded me why I won’t go into full-on food blogging anytime soon. It’s the most frustrating part for me. Juli and I should really think about cooperating here because I really enjoy writing the posts while she’s a natural with the camera. While we’re on the food topic already: Prepared and shared a meal with my family. Our schedules don’t always work out but with my sister around, I really wanted to make this happen. Unfortunately, these dinners always escape the camera but I will have to put my own spin on the recipe I used because it’s one of my absolute favourites ever. Ordered and immediately started two new books [“The Brain – The story of you” by David Eagleman and “Switch” by Chip and Dan Heath] . Voicing my frustration with not having any good reads on hand in my previous post was the final nudge I needed to place an order. When they arrived, I couldn’t hold myself back from starting both already. If you’re always looking for book recommendations, too, I can talk a little more about them once I finish these. So far, both are amazing and just what I wanted. And with that, I’m finishing this post and wishing you a happy Monday! Happiness-inducing today: You guessed it already: Getting to spend a final few hours with P. before my sister left again. Looks like I’m really out of this blogging game, hm? I promise you I’m not. Finishing this post on my mum’s laptop – she’s out of town so not aware I stole/borrowed it – as my own is not up for blogging at all anymore. Yes, I’m aware this problem’s been there for years but now I can finally say I ordered a new one. Just waiting for it to arrive – why, oh why does that shop constantly change the delivery date? – and then delve into posting more regularly again. It’s been very frustrating to draft posts these past weeks and then end up not being able to share them because my laptop would keep crashing about every five minutes. Fun times … not. Enough rambling, though, here are your good good links for the week and I’ll see you again hopefully soon! Not everybody’s going to such extremes but this critical look at our desire to better ourselves all the time is still easily applicable to many people’s lives. We’re all dealing with our own messes and life hurdles that others will never see in full detail or at all. But nobody said that we can’t still inspire others by the things in life we’re passionate about and good at. A really interesting concept for dealing with our anxieties, fear and self-doubt. Definitely one that would take practice but be worth it. When something originally well-intended turns bad … This post outlines the dangers and when and when not a tracker makes sense. It’s nice to see PopSugar add good reminders like this one into their mix of diet-focused content. The essence of this has been said before but it’s worth repeating in today’s world promoting #cleaneating and fad diets all around. Also, it’s important to note she’s stressing that eating a ‘fear food’ once doesn’t mean you’ll loose the fear. Recovery takes time. Children hear and see more than us adults might believe and the way they interprete it can be fatal. This is a good one not just for mums but anybody in contact with children or teenagers. … and they are so much better than it. The money and mental space freed up offer a lot of room for live-enriching rather than restricting things. I’d never thought about the [cultural] whereabouts of this often used term but Heather’s thoughts are interesting. So much yes to this! Or: so much no to engaging in any of those activities or tools helping you grow your account unorganically. Those powders are [still] all over social media but are they genuinely necessary and deserve you spending hard-earned cash on them? Spoiler: I like this reply. This video. Or more specifically watch his reply at 1:32 [hint: it’s the truth about a current trend in the healthy living world]. Also: not-so-secret male crush. Not agreeing with everybody listed here but some really are great accounts. Just follow the rule of only letting positive and uplifting people into your feed/life. Fluffy, maple-sweetened muffin perfection. These really look like they came from a coffeeshop. Yes, I’m well aware Christmas is over but this is too gorgeous to wait another eleven months to share. 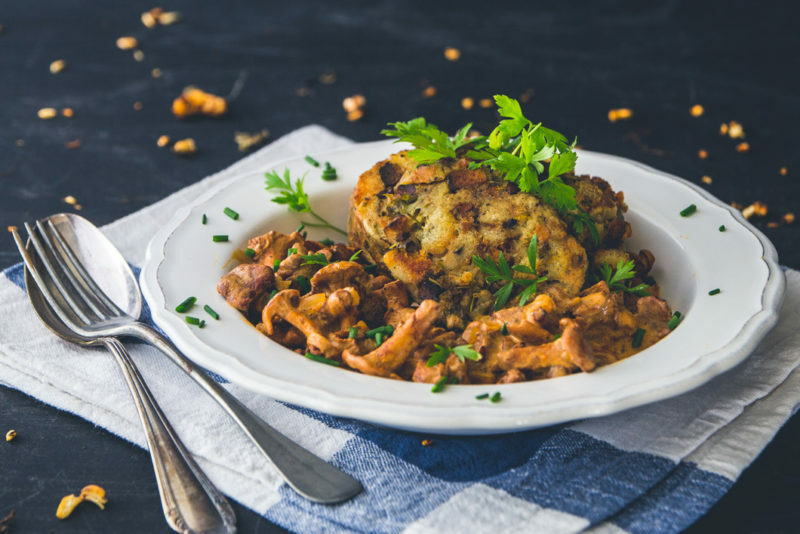 It probably won’t be familiar you but this vegan version of a German classics looks just as hearty and satisfying as the original. Coconut and pumpkin combined lend to the creamiest of results hence why this looks all kinds of dreamy and chickpeas as a vegan option? Well, you know I’m so up for that! Happiness-inducing today: Taking Friday off to visit my sister and P. [poor little boo is sick right now but it was his birthday earlier this week so I couldn’t not go]. Before I get into today’s post: yes, it’s been a while and part of that way my laptop being a pain in the a** again, either constantly crashing or not letting me long into either my WordPress or my Gmail account [has this happened to anybody else before??]. Le sigh. Because it’s Christmas Eve on Sunday and I’ll be traveling the day before that, the Good good links for this week will find their way onto the blog on Friday already. So where have I been? It’s been very silent on the blog after my previous post. Theoretically, I could leave it at the good old “life happened” explanation and in a way you could say that, yes, it did indeed. But not in the average busy-with-work-meeting-family-and-friends way. I genuinely wish it was [just] that. And just as a heads up before I go on here, I want to stress that I’m not writing any of the following to ask for sympathies or be that annoying vague-talking blogger [though I’m sure it might still sound like that to some]. I don’t like people to do that so I won’t, either. Rather, I’m sharing this because – as I have explained before – I can’t not at least hint at what’s going on behind the scenes and pretend life was all sunshine, rainbows and unicorns. It’d feel like lying to you. What happened is that a regular visit at my doctor’s brought about a diagnosis that will change my life and left me in shock. Tears. Sadness. Guilt. Some moments I’m dealing okay [as in: distracting myself as best as I can] but a lot of the time, it’s hard. Sorry I’m being vague but I honestly have told a mere three people in real life so far, not planning on expanding the circle of people in the know, so I hope you’ll understand. There were and are moments when I consider[ed] quitting the blog – the sad moments – but others where I absolutely want to keep writing and staying in touch with all of you. The moments when I test new recipes to hopefully share here or think of topics I still want to talk about. Whew, this is getting long already so without further ado, I decided to steer clear of heavy topics for now [the post I’d originally planned on writing] and just talk about recent things and favourites. Because even though the diagnosis is final, I don’t want to live my life thinking about and focusing on it 24/7 – that’s no solution. Onto the better things in life, my silver linings in every day. A major favourite, especially given it snowed properly for the first time recently [all melted away by now, though]? Christmas music and singing and dancing along. Key to brightening your mood in an instant even if your PE teacher – thanks for nothing, Mrs. S – in school attested you a complete lack of feeling for rhythms. Dance like nobody’s watching. Taylor Swift. have I been living under a rock to only now accidentally finding she’s back on Spotify? Denying this for the reason alone that it’s [literally] living behind the moon in my language 😉. Very convincing Argumentation. Dancing around to my Christmas playlist – hello there, Mr. Buble – while preparing the Semmelknödel might have slowed me down ever so slightly but worth it. So: Christmas! What are your plans? Whom are you celebrating with? What are you having for dinner? What are some of your family’s traditions? It’ll be the first year celebrating Christmas Eve – the main celebration day/evening around here – without my sister [and as such P., obviously] which is … weird. She’s with her husband’s family on Christmas Eve but the three of them will drive over to our house the next day. My parents, brother and I are celebrating Christmas Eve at my grandparents’. Only the six of us on 24th, then a huge family gathering on 25th. And for once, I actually had all my gifts ready a good week ahead of the big day. That’s pretty much of a first [in many years] for me which could be either a win or embarrassing … I can. not. wait. to hand my presents over and see how the recipients like them because I think I found some real surprises. New Christmas chocolate. My taste in chocolate is honestly quite boring. I don’t care for anything filled and nine times out of ten, will grab my regular 80 % cocoa bar. But this seasonal organic one caught my attention on Instagram and when luck would have it being available at my tiny local health food store, I knew I was supposed to buy it. The verdict? Delicious. Still not my #1 which is positive because it’d be a pity with it being seasonal only but definitely worth the money. Maybe not really a favourite because it was a once-only experience but our office Christmas “party” was great. Rather than just following the standard procedure of going to a restaurant, one of my bosses suggested having a cook-out. It’s a lucky accident these sort of evenings [think of something like a semi-guided cooking class with a dietitian] are even offered in this area, given it’s very rural. While I didn’t get to take any good pictures that evening, the memories I made are unforgettable. Cooking and dining a six-course dinner together allowed for a wholly different level of connecting with each other. I’d definitely recommend this to any company – worth suggesting to your boss for the next gathering. If you read all of the above, especially the first part: thank you! Now tell me about your week, your plans for Christmas, favourite Christmas songs, movies – anything! Happiness-inducing today: Scheduling plans to go to the movies with a friend tonight. Another one of those much appreciated distractions plus meeting friends is always a good idea. Hi there and yes, I’m still alive. Leaving the blog world for a whole week after the previous post was not my intention . What happened was that WordPress ever so kindly kept me from logging into my account on several days. This has happened before and I’m still no wiser about the reasons so if any of you are, please let me know. It simultaneously happened with my Gmail account which was extra annoying. Though while not fun, it obviously is a first world problem and didn’t keep me from living my life. Okay, onto some of the happenings from and a few thoughts on the past week. Thanks to Meg for hosting this fun little party to start the week on a good note. Worked. Same old, same old. It was a somewhat busy week which is a positive in my book. There’s nothing worse – again: first world problem – than waiting for time to pass until you can leave during the less busy weeks. Mailed a little birthday package to a very good friend living way too far away. As much as I like surprising others, I have a hard time finding a gift that feels just right. Useful but surprising. My sister – not completely without ulterior motives 😉 – suggested one of her undies so that’s what I got. The birthday girl was really happy with her new donut undies. FYI: This post is not sponsored by my sister – I bought the undies from my own money ;). Spent time with the cutest little fellow in my world [aka: my nephew], my sister and my parents. I’ve seen them – my sister and P. – less often and miss having them around. It’s fascinating how fast P. is developing now – not just in terms of growth or vocabulary but in character. Being honest here, he’s sweet but definitely a little wild thing and hyperactive at times. Still cute. Plus, he’s calling me by my “pet name” now and has those adorable snuggly moments so it all balances out. Can’t he stay little forever, please?! Met up with the aforementioned friend for another cooking date. It might unfortunately be our final one for this year with the holidays and lots of invitations coming up. Sad because the afternoons at her house are the epitome of nourishing for me. Cora wrote a post about this that really resonated with me. What makes a meal or a moment in life nourishing isn’t necessarily or at least not solely about the food. Yes, some foods do feel more nourishing than others. But how far does that go if we’re not feeling nourished wholly? The meal with my friend was just that through the setting – I really like her kitchen: lots of light, a few decorations and an overall cozy feeling -, the company and, yes, also the food. Feeling full but not uncomfortably, taking time to eat and having a deep conversation. 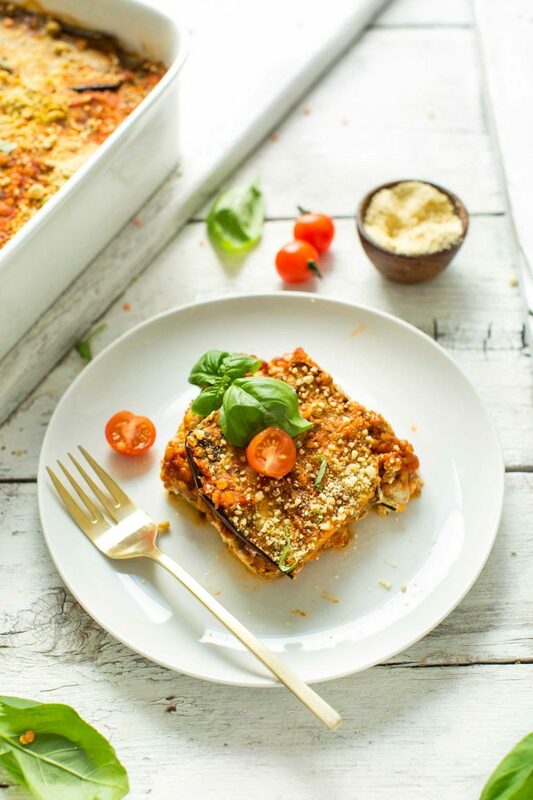 Oh and since I figure you might wonder: we tried Dana’s Lentil Eggplant Lasagna. Repeat offender …What can I say? There are a million blogs but I simply trust her recipes and have so many I want to try. It’s actually funny I chose the lasagna because I neither like eggplants nor tofu much but the reviews were incredibly positive and it fit my criteria of offering enough tasks for two people. The verdict? So good! The sauce is super simple but flavourful [I didn’t use store bought marinara but a bottle of unseasoned tomato sauce, adding talian herb seasoning], the tofu ricotta actually delicious on its own already and the eggplant? Oh well. I thought it was cut into too thick slices as per the recipe. My friend would have liked more of a spicy kick – as did my mum and sister who got to try some leftovers – but enjoyed it. Her husband missed the meat [and I didn’t expect anything else to be honest]. You can’t please everyone even with dishes that got rave reviews on the blog. I actually took a few pictures this time but they didn’t turn out so I’ll use one of Dana’s here. I highly recommend you give it a try. Had dinner with my parents, sister and P on Saturday night. Since I liked the lasagna so much, I made it again and can now say it’s definitely way faster to assemble the second time around. Slicing the eggplant into thinner rounds this time really made me enjoy it even more. It was only me eating this – the remainder of the family had Serviettenknödel [containing eggs so not for me] with mushroom cream sauce – but it was sharing a meal and time spent together that mattered. Yet another nourishing moment in my week. Went on a walk with my mum on Sunday afternoon. She suggested it after we’d waved goodbye to my sister and P. I’m glad we did despite the frigid temperatures because our conversation and getting a good dose of fresh air was just what I needed as a finishing touch to the week. It wasn’t the happiest week for me but I’m always trying to shift my focus on the silver linings and try to be forgiving [of myself and others]. Happiness-inducing today: Family time. That’s not to say we were always getting along but it’s the overall happiness that’s on my mind still right now. Have you tried any new [blogger] recipes lately? Which ones?